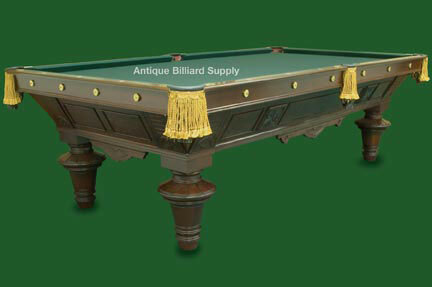 #3-01 Striking Brunswick antique pool table with extensive carvings and reliefs. Classic appearance from rich, dark cherry finish highlighted by rosewood rail tops. This example from the 1880s is a one-of-a-kind variation of the standard Brunswick designs of that era. Round legs with raised facets on the top surface. Hand-carved panels on the sides of the cabinet and carved accents at the lower edge of the cabinet sides. Completely restored, ready for immediate delivery.